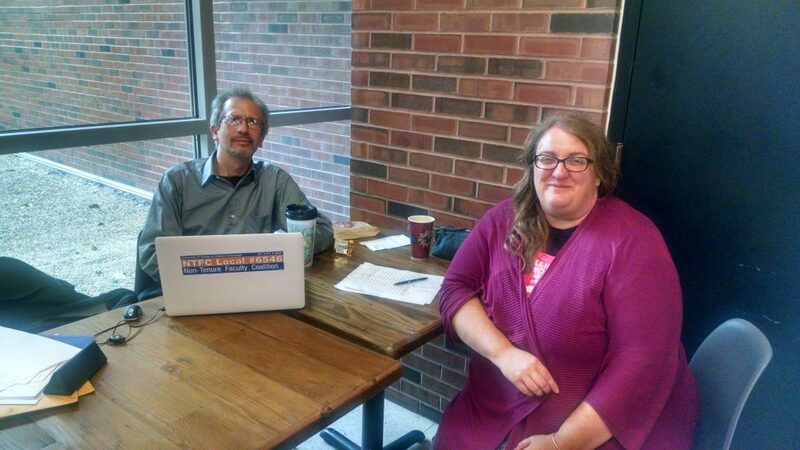 Two of our NTFC Stewards — Dave Dubin and Stephanie Fortado — hold informal coffees every Thursday to meet with union members (and others). Dave and Stephanie represent specialized faculty in the Beckman Institute, the Intensive English Institute, the School of Information Sciences, The School of Labor and Employment Relations, the School of Social Work, and the University Library. They meet informally with any person who would like to bring questions or discuss concerns about NTFC, our contract, or any issues relating to work as specialized faculty on this campus. You can meet with Dave and Stephanie on Thursdays according to the schedule below. The coffees rotate among the following locations, as listed on the calendar below. Espresso Royale – Sixth and Daniels, C.
Panera Bread – 616 E. Green St., C.
Espresso Royale – Oregon and Goodwin, U. Stop by with your questions, or just to meet other specialized faculty!